When people leave the theatre squealing, it is safe to say that something exciting has happened. John Wick: Chapter 2 made me very, very excited. Reprising the titular role from the self-named original of 2014, Keanu Reeves returns as the hitman who “just wants out.” He says this in a ridiculous number of languages (English, Russian, Italian, and American Sign Language) by the film’s end, but finds himself unable to leave; enter a wild series of grandiose action that induces awe and discomfort all at once. Reeves delivers another electric performance, working with director Chad Stahelski to continuously push the limits of the audience’s imagination through immaculately choreographed fight scenes. The violence, if not the gore, is gratuitous; there is no way around that, but it is visually impressive and any action movie fan will love it. Self-referential at times, and eerie at others, Chapter 2 doubles down on everything that admirers appreciated about the original. There seems to be much more violence and action, which is saying something, and in a refreshing change of pace from recent attempts to emulate the old-school R-rated action flick, it never feels phoned in. 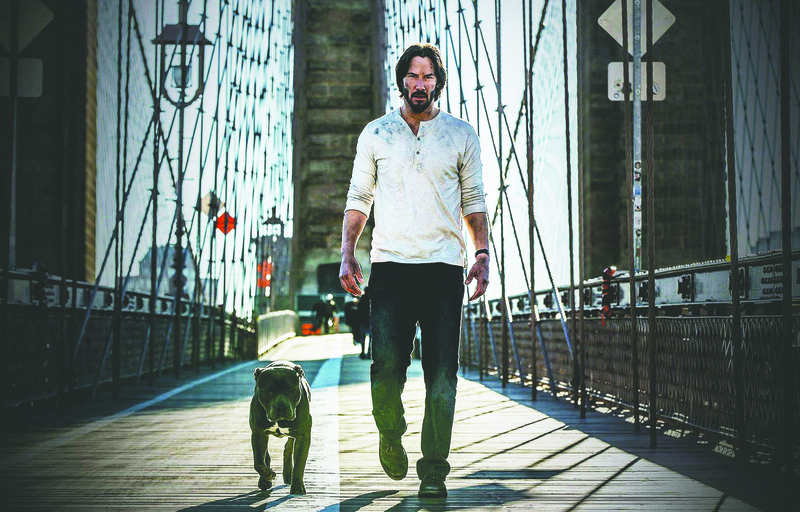 Reeves’ energy and commitment to the fight scenes are both admirable, and realistic-looking to the point of anxiety — it is almost jarring when compared to the absurdity of what John Wick is actually able to do in a combat scenario. Fighting is not Chapter 2’s only selling point; the mysterious glimpses at an underworld in John Wick are explored further, as the rules that govern Wick’s world of gentlemanly assassination are revealed bit by bit. The tease continues, however, left with only a name and the slightest idea to its structure, the audience is left intentionally clueless about an increasingly encapsulating secret society. Nothing requires explanation, as the world is established enough to feel real, but there is plenty of room for fans to imagine what they want. Just as the story allows audience interpretation, the cinematography leaves little to the imagination. Well-framed and well shot, it is easy to see and understand every sequence of action, however extreme the set up. Whether in a world of mirrors or a coliseum nightclub replete with purple strobe lighting, it is never difficult to follow the action, due in large part to a substantial lack of computer generation — Reeves, following his own example, performs most of his own stunts. Executing on an even more ridiculous setup than its original, John Wick: Chapter 2 delivers on every promise, and excels on fronts of action, drama, and art.